This article explains the fundamental difference between wifi and internet. 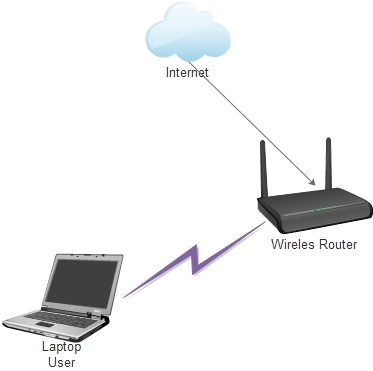 In the below diagram, a wireless router is connected to the internet. To gain internet connection, the user initially has to connect to the wireless router. The wireless router or the wifi router, has a wireless radio inbuilt. This radio broadcasts the name of the wireless connection , which is SSID of the access point. The name of the SSID is what you see on your wireless network adapter icon on the laptop. This technology is Wifi. As you can observe that, Wifi is entirely different from Internet. The users uses wifi as a medium or channel to access the internet which is connected to the wireless router. To understand further , a step by step analysis is outlined below. 1. The user opens the laptop and checks for the available wireless connections or SSID’s on the wireless network adapter icon. 2. Once the ssid is identified, the connectivity to the wireless router is established. 3. After the connectivity is established, Wifi connection is enabled and the user can connect to other devices which are on the same wifi network. 4. The user also receives credentials from the wifi router like IP address, subnet mask, default gateway, dns servers etc. These are used for accessing the internet as well as other devices on the network. 5. Once the wifi connection is established, and the credentials are received , the user would be able to access internet. The presumption that wifi and internet are both the same , is incorrect. They are totally different as explained in the article.